There are several affordable hotels near Charleston Port for cruise passengers sailing from Charleston, South Carolina. Currently, Carnival Cruise Lines is the only cruise company sailing out of Charleston. The Charleston Cruise Port's address is: 196 Concord Street, Charleston, SC 29401, and there are many desirable hotels near the port. Why stay overnight in a hotel near Charleston Port? Simple: there are several attractions to see and "do" in Charleston. Below are some of the many attractions near the cruise terminal, giving you and your family a strong reason for staying in a hotel near Charleston Port before or after your inclusive Caribbean cruise. There are: Battery Park, the Aquarium, Fort Sumter, the Old Market, the Citadel, Battery Carriage House Inn, Boone Hall Plantation, USS Yorktown, and Patriot's Point. Additionally, there are several tours from which to choose. For additional information on each attraction above plus many more Charleston attractions, click here. 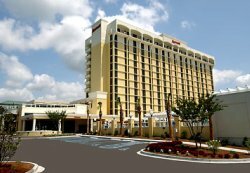 The Charleston Marriott, which is located at 170 Lockwood Boulevard, Charleston, South Carolina, 29403, United States, gets a 4.5 out of 5 rating from guests who have used the hotel. The hotel is close to several points of interest such as the Charleston IMAX Theater and the Avery Research Center for African-American History. Additionally, it is less than a mile from downtown Charleston, and 15 miles from the Charleston International Airport (CHS). * The cruise terminal is nearby and easily accessible by taxi. Guests of the Marriott Hotel Charleston may use the shuttle bus service for a small fee. The Holiday Inn Mills House, which is located at 115 Meeting Street, Charleston, South Carolina, 29401, United States, gets a 4.3 out of 5 rating from all previous guests. This hotel has been recognized by Frommer's Charleston Guide on its "best" lists and has been named by Conde Nast to the Gold List of the World’s Best Hotels. The Mills House Charleston hosted both General Robert E. Lee and President Teddy Roosevelt. The hotel is only a half mile from the Battery District, and is close to the aquarium, Waterfront Park, and the King Street Antique District. The Mills House Charleston opened in 1853. However, while its rooms are styled with period reproductions and there are invaluable antiques throughout the hotel, you will find modern amenities such as a fitness room, an outdoor pool, plus coffee-makers, free free high-speed access and hairdryers in each room. Caution: Parking at the Mills House Charleston is $20/ day for self-parking, and $22/ day for valet parking. * The Holiday Inn Mills House is located about 11 miles from the Charleston International Airport. * Charleston Cruise Port is even closer and easily accessible by taxi. 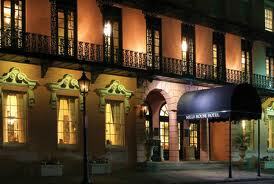 There are many other hotels near Charleston Port from which to choose. To get a better idea of the hotel choices and rates, please use the TripAdvisor Search Box below. Cruise passengers can fly into Charleston International Airport (CHS), which is just 20 minutes from the cruise terminal and nearby hotels. Some hotels offer shuttle service from the airport. Besides shuttle service offered by hotels (check if complimentary or if there is a fee), your family may use the airport shuttle service ($12/ person) or taxi service to get to your hotel or the Charleston Cruise Terminal. For the taxi service from the CHS, the fare is about about $27 for the first 2 people - each additional person pays $12 each. 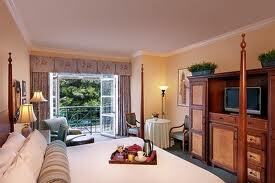 I have only scratched the surface in terms of showing you hotels in Charleston, South Carolina. I trust that you and your family will find the right hotel near Charleston Port and enjoy the city's rich combination of historical and modern attractions before or after your inclusive Caribbean cruise.